Why am I so confused? Why is everything going straight to hell? Have I done something wrong?Have I messed up? I am losing everyone that I love and care about… And I am losing myself...I am falling....Black is all around me... 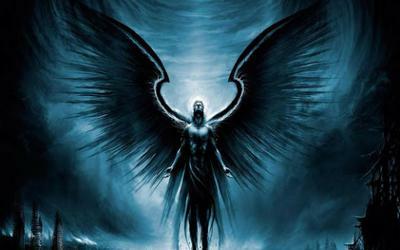 I always wanted to fly... but never to fall...now my wings are broken, and my halo has fallen off.I am no longer an angel of light,A set of demon horns replace my halo. And on my back,not light, fluffy wings but black,tattered,painful things.Chained to the ground with little room to move around,on my knees I look up and see the things that own my soul dancing around me,a torturous smile on their faces,Their evil eyes boring into what's left of my soul. All my regretful memories playing on rewind,life throwing me to the wind years and years ago,all of these memories torturing me,making me think I am worthless,forgotten,and a nobody. He is my master and I am his slave. I am trapped in his world nowhere to go. He gives me a job, I have no choice but to accept it. He tosses a shadow that falls at my knees and tells me to rise without regret as my chains break and I stand straight up.Without hesitation he tells me to place the shadow around my shoulders and never show my face to anyone.He tells me the shadow is my cloak,my invisibility,my shame,and my regret.He said it will hide me until my job is done. Before I leave the pit his hands appear to me,Holding within them a shine from two spears of death. He handed me the daggers and as I unsheathed one its mesmerizing beauty overtook my soul. Although I am curious and scared I had to ask "why?". He explains that this is my destiny. I had no choice and neither did he. It was always meant to be whether he and I liked it or not. I opened my arms and wings to her and told her to trust me I meant no harm. Although she was frightened and reluctant she came into my arms anyways. I flew her away from the pain of everyday living,I took her to a place of peace,light,and prosperity.The heavenly place I could no longer enter.When I approached the gates the guardian angels rushed me away saying that I was no longer allowed there,no longer a friend or sibling.I had become the enemy, the beast,the disgrace,and the forsaken one. I told them that I was returning a soul that has not been lost. The girl needed a safe place to go where there was no pain. I placed her in front of the gates and flew away not looking back. My eyes started to burn with tears, the pain in my chest started to swell up. I had to return to my master without his precious prize. I knew what I had done was wrong and that the punishment would be severe. Entering the dark, damp, musty corridor I was suddenly tied to the ground again. The chains of my past seem to find me in the dark and drag me to the ground. My master appeared with a whip of fire in his hands.Then I knew that this would be my punishment. With every burning crack,I knew that my heart would heal,and that the girl would dance on the clouds forever happy.Meanwhile I suffer alone in this darkness and punishment,sitting,waiting for a sign of hope to unchain me inside this deep,lonely,scarring,burning,darkness. for being my true,pure,loving,and secluded,emotional self. I am tired of suffering like this.There is no reason why any soul should be suffering as much as mine.We all deserve something for our righteousness in this world dead or not.Soon I will be broken from this curse and break free to be myself,And roam the world free of this nightmare I live in,Free of the tyrant who rules over me making me do such horrible things to the souls of the innocent,Torturing them to no end and taking them for him to enjoy and hurt,I’m tired of this all,I need to be free,forever.Out of hell,the darkness,and the flames that its made from. And as I move on I will remember the sins I committed and learn from them,and one day find a day i will fall in love with the right one like me and finally return to heaven.Free from my burdens I have caused upon myself,And free from the regretful memories of my past. Freedom the only thing I need,is so close yet so far,And happens to be life’s great lie,But I will get it.One day the moment will come.And when it does there will be no going back.